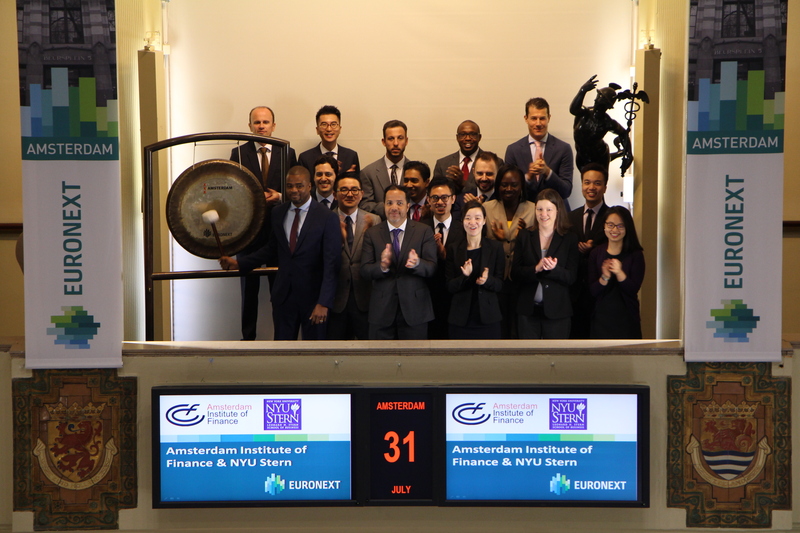 Amsterdam Institute of Finance (AIF) visits Beursplein 5 with the participants of the Master of Science in Risk Management for Executives program. A Master’s program aimed at professionals in Risk Management. This program is spread over several modules and is held in New York, Amsterdam and Abu Dhabi over the course of one year. The program is offered in collaboration with NYU Stern School of Business. AIF is a foundation specialized in providing high-level financial training for finance and other professionals. Located in Amsterdam, AIF was established in 1990 as an initiative of the Dutch financial community. Since then, AIF has built a strong presence worldwide for its open enrollment programs as well as its custom made in-company training. 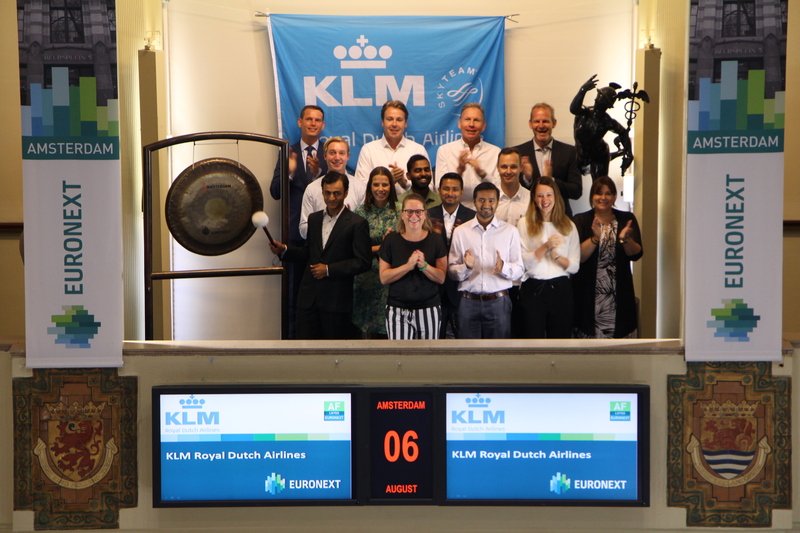 The Amsterdam exchange is opened by the KAS Lab. KAS Lab is a meeting place and testing ground where innovative ideas are thought out. Internal and external innovators work together to turn an innovative idea into an innovative solution. 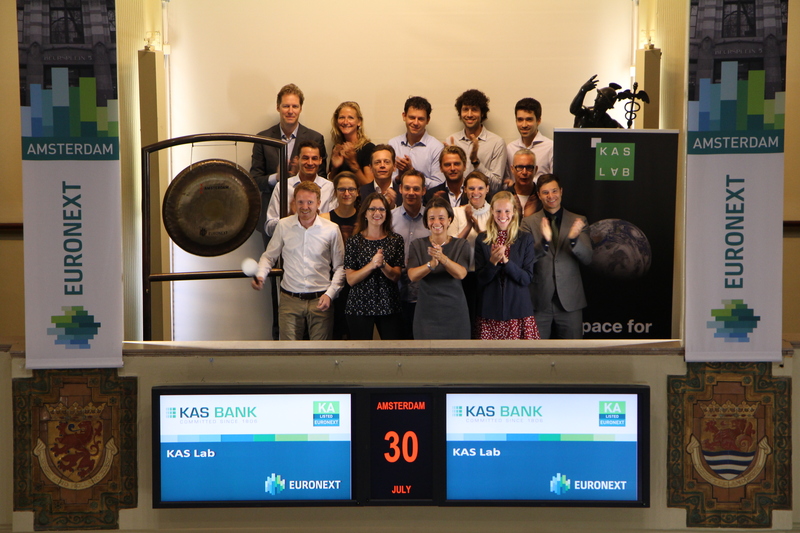 With two innovative propositions, KAS BANK (ticker symbol: KA) demonstrates that blockchain technology enables to make complex processes in the financial industry more efficient. The bank is convinced that this will increase confidence and make the financial sector more effective, faster and transparent. KAS Lab, KAS BANK's innovation hub, has successfully tested a blockchain product for voting (Voteroom) at annual shareholder meetings (AGM’s). In addition, KAS Lab is preparing the market launch of the second blockchain initiative, Tokenised Asset Offering for unlisted funds (TOKAS). 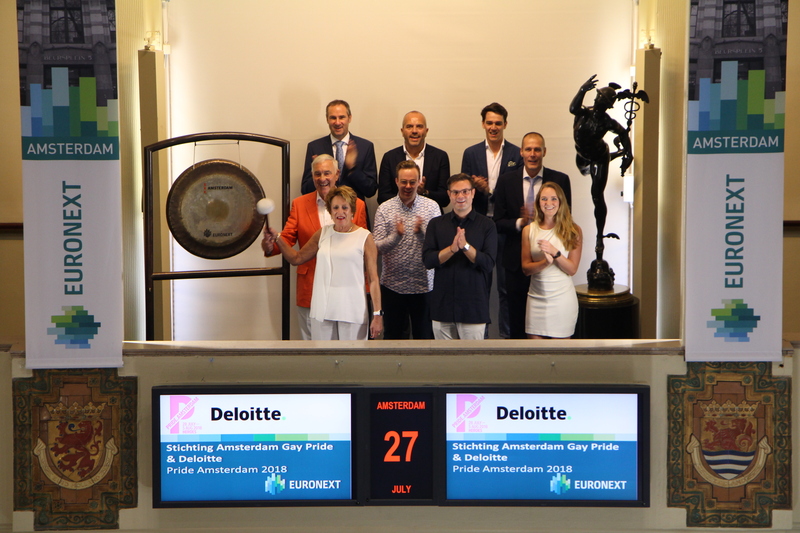 The Amsterdam Gay Pride Foundation, together with their ambassadors and a delegation from Deloitte, opens the trading day and marks the start of Pride Amsterdam 2018. This year’s theme is: 'Heroes'. Pride Amsterdam is a nine-day 'festival with content'. Every year, hundreds of thousands of people stand along the canals to enjoy the traditional boat parade. However, the organization of the Pride this year is 'bleak' when looking at all kinds of developments in the world. "Our festival is a platform where everything comes together", says director Lucien Spee of the Amsterdam Gay Pride foundation. This year, the organization of Pride Amsterdam wants to pay special attention to human rights in the world with the traditional boat parade. The 'Meer dan gewenst' foundation received the first 'Support Card 2018' from Rabobank. Sport also plays a central role this year. It has been exactly 20 years since the Gay Games in Amsterdam took place under the motto "Friendship through Culture and Sports". For Deloitte important: We are all heroes and winning by being our true authentic self. Deloitters in cooperation with Deloitte FIT ambassadors give a look back at 20 years of Gay Olympics and the sporting heroes of today with their boat during the boat parade. Wim van den Bosch, CEO MPS Group B.V. (MPS) sounds the gong to celebrate the management buy-out by ABN AMRO Participaties of MPS. Van den Bosch joined MPS in 2013, and is responsible for the overall strategy and general management of MPS. He will be joined on the gong stage by Willem Huijink, CFO and responsible for finance, tax, IT, purchasing, HRM and facility management. MPS is a leading provider of high-quality versatile, end-to-end narrow and mid-web printing solutions. The Company’s flexographic (“flexo”), offset and flexo-digital hybrid printing presses are used in the fast-growing label and flexible packaging industries, with end-markets such as food & beverage, household products and pharmaceuticals. ABN AMRO Participaties is a subsidiary of ABN AMRO Bank (ticker symbol: ABN), which provides for sufficient access to knowledge and equity capital in order to support their portfolio companies in their growth plans. China Post Global, the international asset management arm of China Post Fund, marks the listing of its newly-launched Market Access CoCo bond ETF by sounding the gong on the Amsterdam exchange. 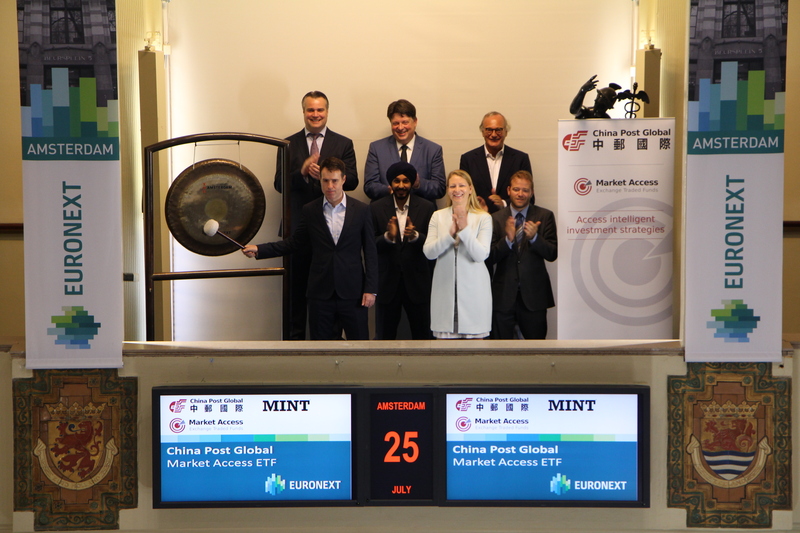 China Post Global is joined by MINT Partners, a division of BGC Brokers LP and the lead distributor for the new ETF. The Market Access Markit iBoxx EUR Contingent Convertible Liquid Developed Market AT1 Index UCITS ETF (ISIN: LU1812903158) is the first ever EUR-based CoCo bond ETF. The new ETF provides diversified exposure to euro-denominated AT1 contingent convertible (CoCo) bonds, and tracks the iBoxx institutional benchmark index for European bank CoCo bonds. China Post Global is the investment manager and sponsor, MINT Partners is the lead distributor. China Post Global is the promoter and global distributor of Market Access ETFs. Market Access is a family of innovative Exchange-Traded Funds (ETFs) created in 2006 and providing access to commodities, emerging markets, smart beta strategies and credit markets. Market Access was launched in 2006 by ABN Amro, and managed by RBS from 2007 until February 2016. China Post Global acquired Market Access ETFs on 1 March 2016, as the first Chinese asset manager with its own ETF issuer in Europe. 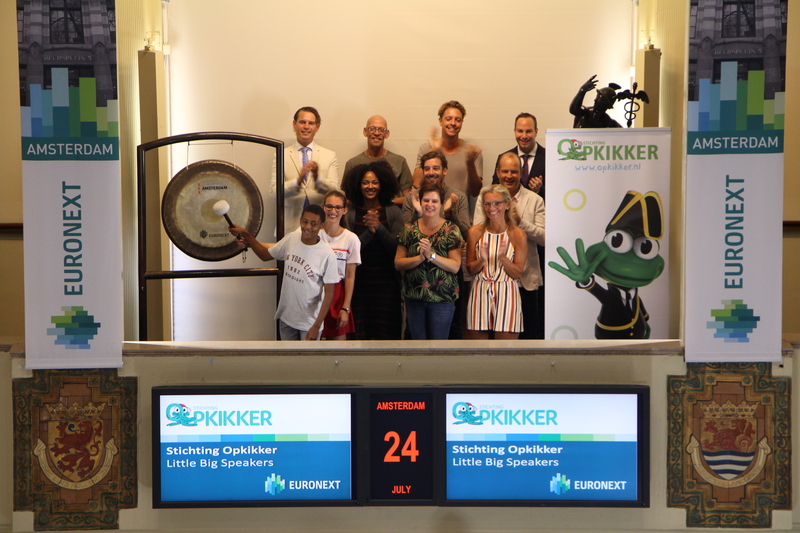 Bram van den Heuvel (15) opens the trading day on behalf of Charity organization ‘Stichting Opkikker’. Bram is one of the Little Big Speakers, the foundation's new initiative, where young patients have been trained as professional and motivational speakers. All Little Big Speakers have a unique story. The wisdom of life - imposed by their illness – have been transformed into inspiring stories about zest for life, perseverance and motivation. They always combine these stories with an inexhaustible childlike positivity. This makes the Little Big Speakers an asset for any corporate event. In addition, booking a speaker is equivalent to a donation to Stichting Opkikker. So in addition to a good dose of inspiration for employees and business relations, organizations also help thousands of families spend an unforgettable day. Dorien van Basten, Co-initiator of the Finance Run & Director of Stichting Nationaal Hypotheek Label, sounds the gong for the Finance Run. The Finance Run is a sporting and informal network event in the financial services sector. The proceeds benefit the LEF Foundation (LEF stands for Life and Finance) and aims to make young people financially more aware. 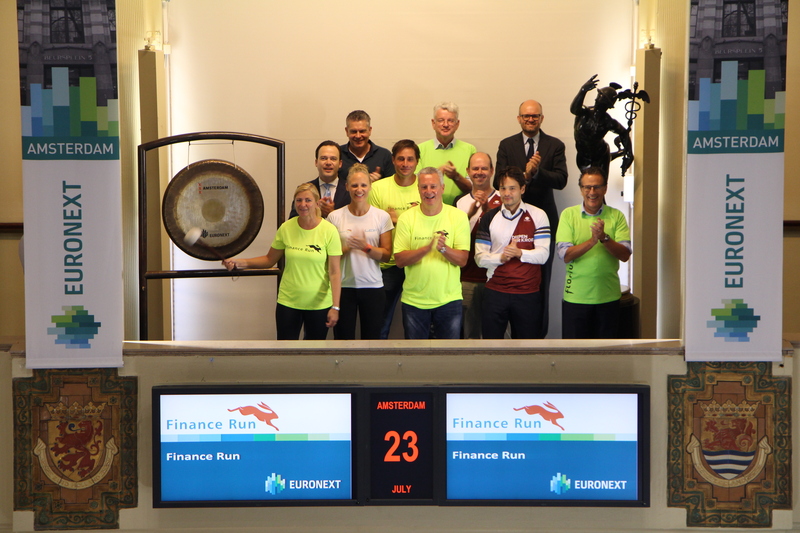 The Finance Run will take place on Friday 7 September 2018 at the Bosbaan in the Amsterdam Forrest. It is expected that 1,000 financials will participate, individually or with a company team. This will be the 5th edition, with the number of participants - and therefore the revenue for LEF - steadily growing over the years. In addition to the sporting part, there is an extensive networking drink including dinner and there will also be an auction after the award ceremony for the benefit of the LEF Foundation. The broadcast of The Friday Move, the popular BNR program, will take place from the Finance Run this year. The Finance Run is organised by Free Style Events. 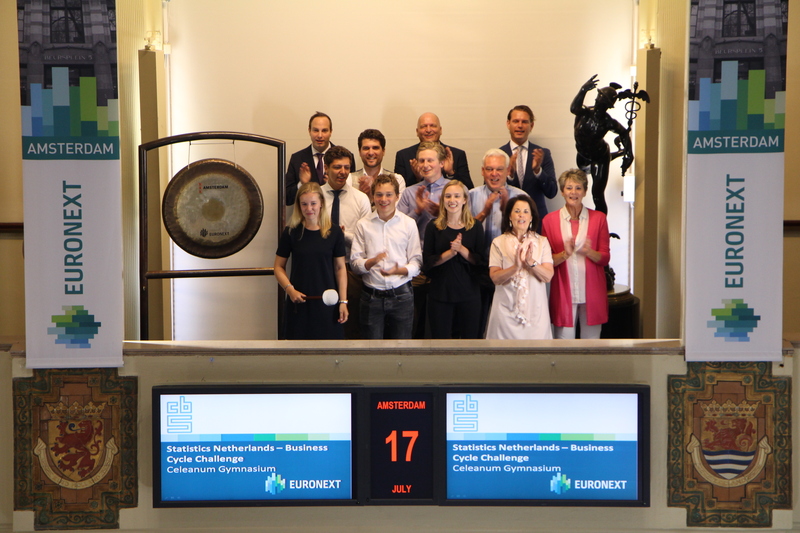 Van Lieshout & Partners visit the Amsterdam exchange of Euronext. Director/owner Erik Beekes, opens the trading day. 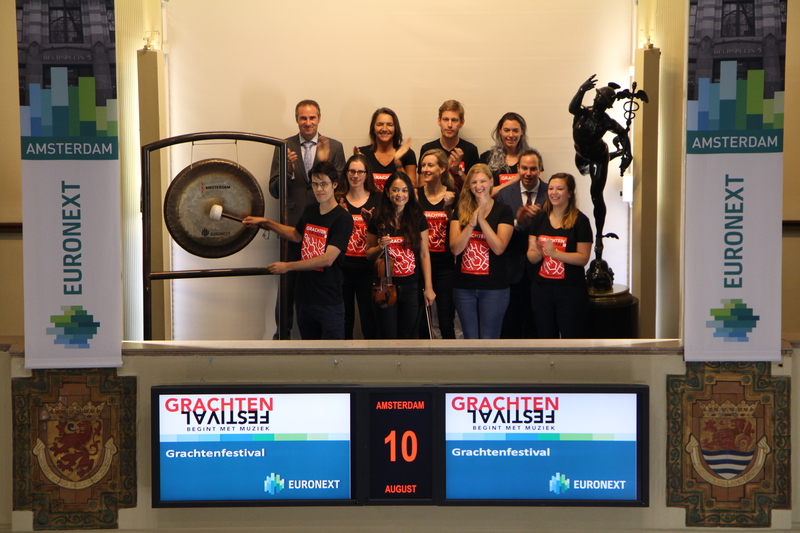 Van Liesthout & Partners sounds the gong together with InsingerGilissen. They do this on the occasion of their 20-year anniversary as independent asset manager. 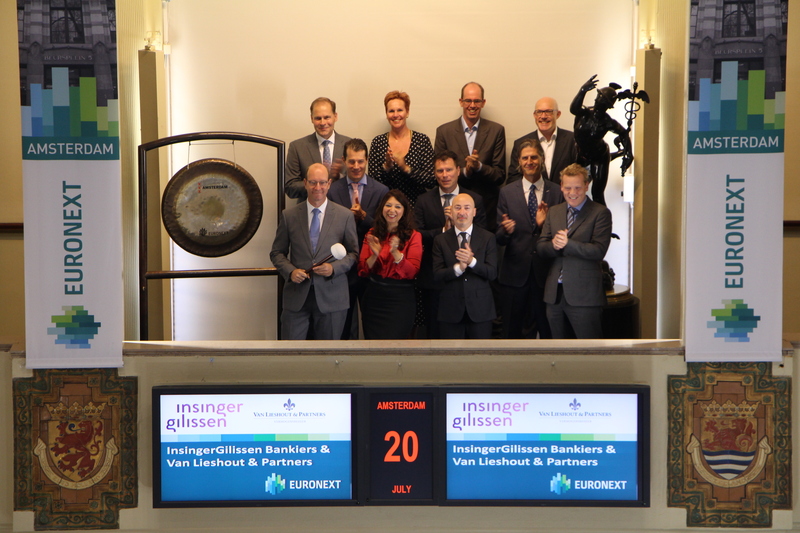 Another cause is the company’s 10-year partnership with InsingerGilissen as custodian bank, with which it worked towards the introduction of options on ETFs on Euronext Amsterdam. 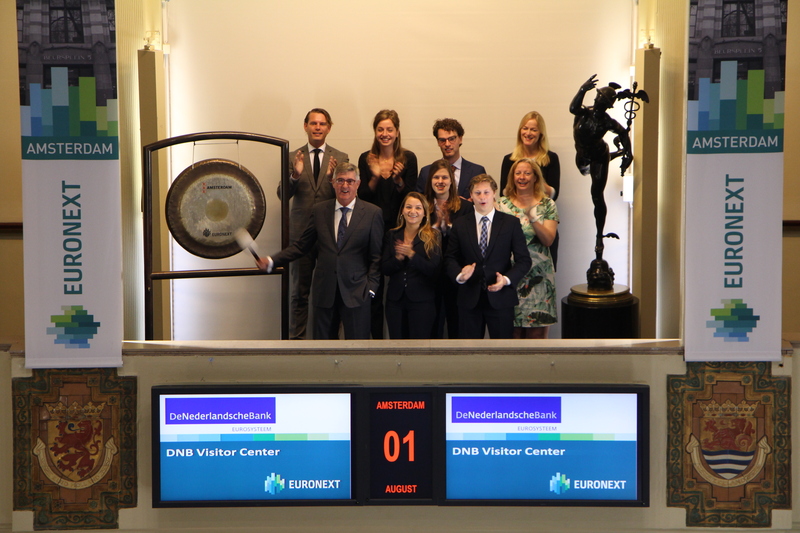 With the sounding of the gong at Euronext on Beursplein 5 in Amsterdam, VanEck celebrates the completed acquisition of Think ETF’s. The new management is working on an expansion of the combined product range across Europe. 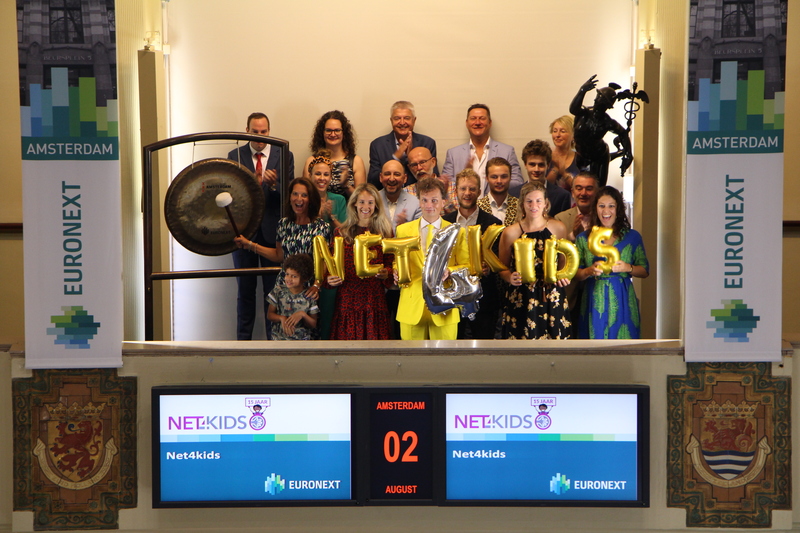 Martijn Rozemuller and Gijs Koning, the two new directors of the European company, celebrate the acquisition of Think ETF’s with the sounding of the gong, completed on 29 June. 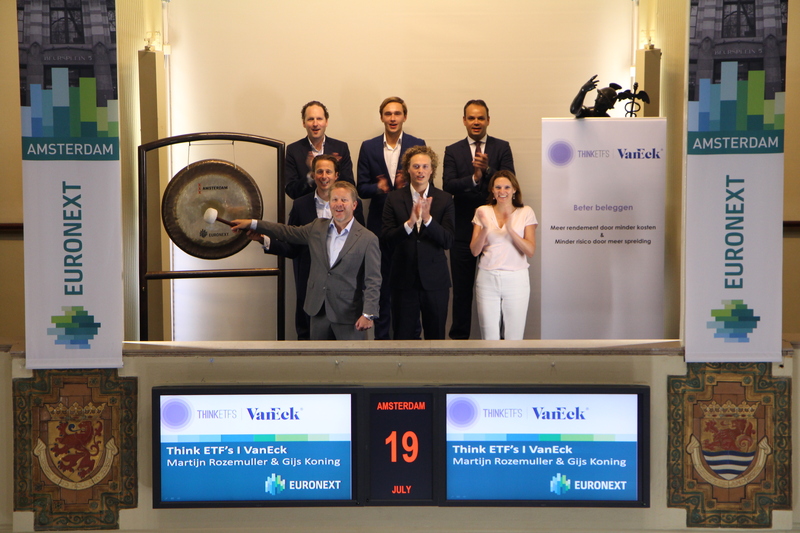 Together, the two founders of Think ETF’s will now form the management of VanEck Europe. Knab sounds the gong on the Amsterdam exchange of Euronext and opens the trading day. Stephan Vinkenborg CTO IT of Knab sounds the gong. Knab celebrates that it has become the most popular bank among freelancers in only 4 years’ time. Knab, the online platform for financial overview, was founded in 2012 and has more than 130,000 customers and about 200 employees. Knab wants people to get a grip on their finances and have insight into their financial future. 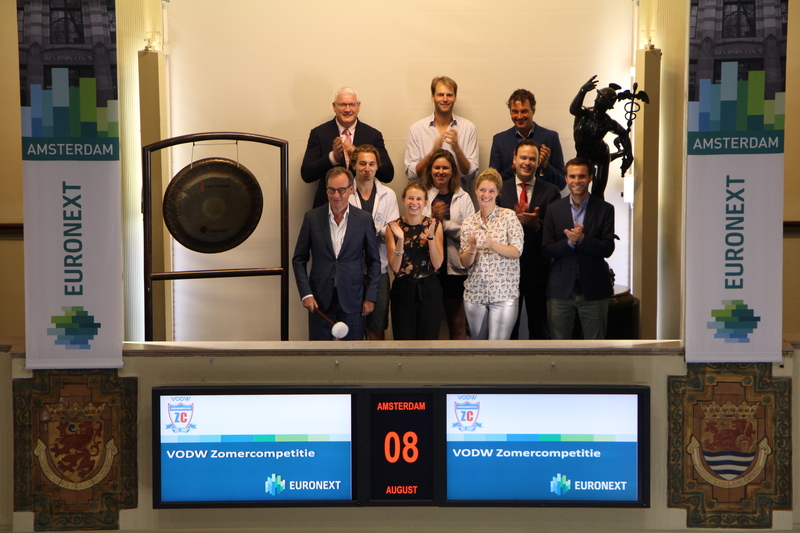 Class 6 of the Celeanum Gymnasium in Zwolle sounds the gong as the winner of the Statistics Netherlands’s Business Cycle Challenge 2017/2018. 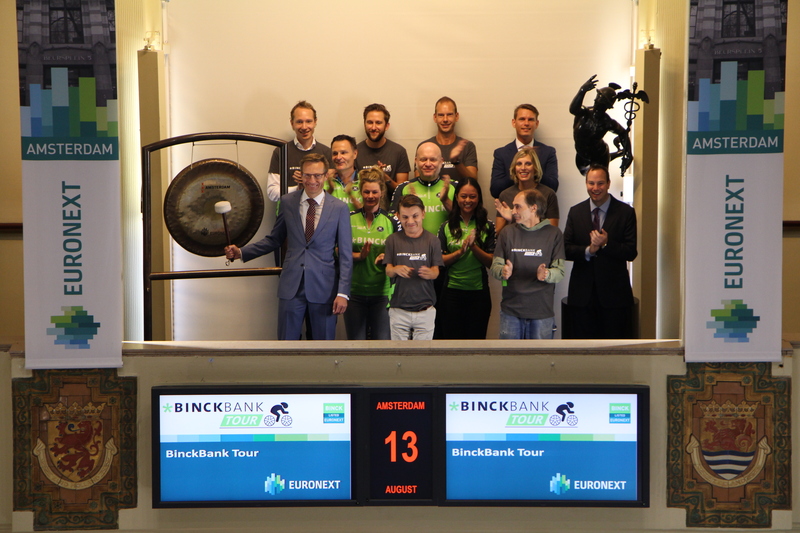 Every year, Statistics Netherlands (CBS) organizes the Business Cycle Challenge. In this contest, high school economics classes predict the development of the Dutch economy using 10 indicators, including the AEX index. Students analyze historical sequences, compare indicators, make connections and follow the news to make a good prediction. They will have to collaborate, analyze, investigate and argue. The Four Days Marches are a walking achievement event for four consecutive days, in which annually tens of thousands walkers are participating. In 2018 at the 102nd edition of the event, some 45,000 participants will attend. The organization behind the Four Days Marches open the trading day by sounding the gong. Participants from 84 countries come to Nijmegen to walk four days, respectively 30, 40 or 50 kilometers per day. On those days, people from all over the world come to Nijmegen to walk in and around the city and its beautiful wooded surroundings. Hundreds of thousands of spectators are cheering on the walkers along the route every day. After four days of walking, a glorious entry along the Via Gladiola awaits the walkers. The 102nd edition of the Four Days Marches will start Tuesday July 17th at 4 AM. There are three important partners that support the organisation of the Four Days Marches: Koninklijke Wandel Bond Nederland, Defense and the City of Nijmegen. Furthermore, the Four Days Marches are supported by its many sponsors that have contributed to the growth of the Four Days Marches by offering their services or financial support, making it the largest international walking achievement event. The City of Amsterdam opens the renewed Beursplein by sounding the gong. 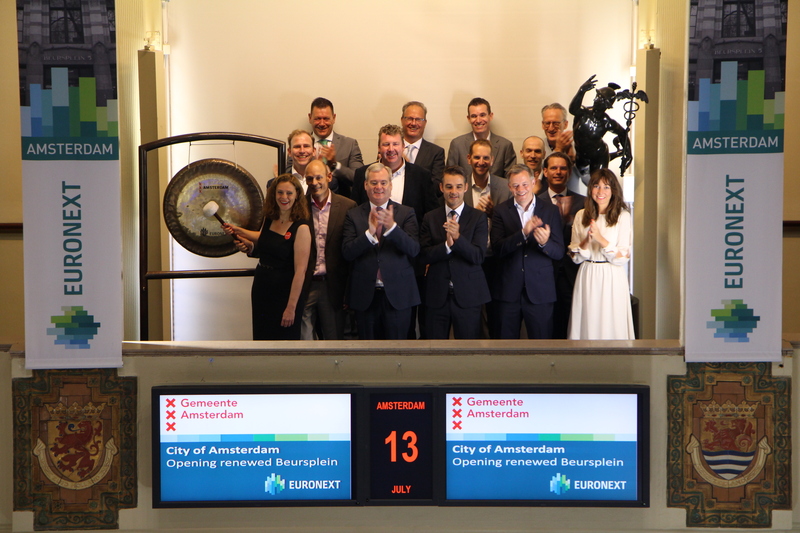 In 2017, the city started building an underground bicycle garage and renewing the area surrounding the Amsterdam stock exchange. After completing this work, the Beursplein has once again become a beautiful square, with the original horse troughs and lanterns designed by the famous Dutch architect Berlage. The statue of the Charging Bull by artist Arturo Di Modica has also found a new place on the square. The festive inauguration of the Beurs area and the underground bicycle garage takes place Friday 13 July from 15:00 on, with the official opening at 15:30. After the opening there will be several festivities on the square and in the underground bicycle garage. 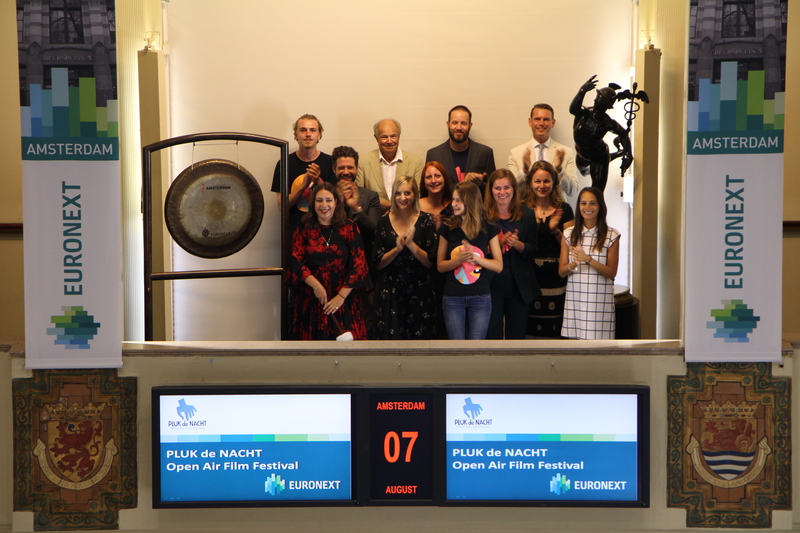 The trading day is opened by triple European beach volleyball champion Reinder Nummerdor, tournament director of the DELA European Beach Volleyball Championships in 2018. He participated in the Olympic Games 5 times and placed 4th in 2012. On 15 July the EC DELA Beach Volleyball 2018 will start in four cities: Apeldoorn, Utrecht, Rotterdam and The Hague. The best beach volleyball players in Europe play at four unique locations in these cities. The semi-finals and finals will be played in the Sportcampus Zuiderpark, The Hague. The DELA EK Beach Volleyball takes place simultaneously with the World Cup Seat Volleyball and the European Championship Volleyball U20 men. 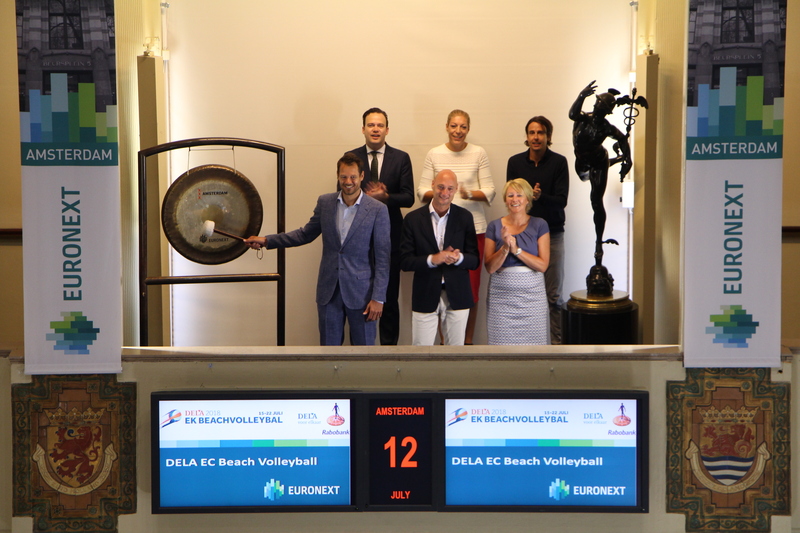 The DELA EK Beach Volleyball is organized by sports marketing agency TIG Sports in cooperation with the Dutch Volleyball Association. Rabobank is a presenting partner. DELA insurance and funeral care is title sponsor of the event.